If you spend much time searching the Amazon website, you may have come across this volume. 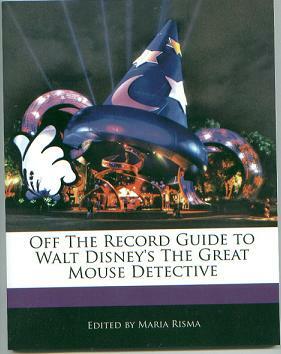 On the surface, the Off the Record Guide to Walt Disney's Great Mouse Detective sounds fantastic! A book about the making of this film is long overdue and would be welcomed with open arms and wallets. But let's take a closer look. We suspected this book was bogus from the start, but as a cataloguer and reviewer of Great Mouse Detective merchandise, we thought it was necessary to see it with our own eyes, if only to inform the public. Besides which, there are many other "books" in the "series" (we use the terms loosely) covering other beloved Disney movies, which, if legit, would make interesting reading. "We believe books such as this represent a new and exciting lexicon in the sharing of human knowledge." So says the publisher's blurb, but be aware that there is nothing in the least exciting about this format. Culling information readily available on the internet, the editor, Maria Risma, collects it into book form. To her credit, she doesn't pretend the finished product is anything more than that, a compilement of facts from the public domain. And it might be enough for a diehard fan if it was done well. However, the information presented is not at all written in an interesting fashion. An intelligent 6th-grader could've created something more readable, not to mention entertaining. The text has no style whatsoever. What it does have are mistakes a junior editor should have spotted and corrected, including, but not limited to a lovely blank space every time a quote is indicated. Even the title is grammatically incorrect without the necessary hyphens. The end result is a slap-dash effect far inferior to the most amateurish web site or blog you're likely to find on the web. The first 56 pages consist of a history of the Walt Disney Company, and it wouldn't surprise me one bit if the identical pages are found in every single one of these Off-the-Record Guidebooks (see how it ought to be written?) Pages 90 to the end trace the history of Sherlock Holmes. Which leaves 34 of 138 pages about the purported subject of the book, namely The Great Mouse Detective. Most of that is taken up with biographies of the cast and crew, little of which has really anything to do with the film. There are two pages concerning the Eve Titus book series, and, when all is said and done, a grand total of four pages about the movie. And nothing there is unusual or groundbreaking. The information is the most elementary, if you'll pardon the expression; you'll learn more if you visit IMDB. Just one really interesting little-known fact would've gone a long way toward making this tome palatable, but there are simply none to be found. You may be wondering if this is simply the best that can be done in creating a book of this kind, with no access to any official or copyrighted Disney material. Not so. 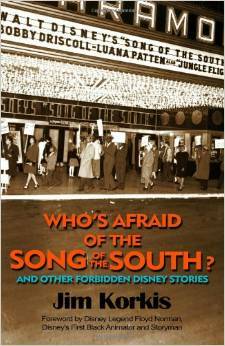 Let us bring to your attention a book titled Who's Afraid of Song of the South?. Like the Off-the-Record-Guide, this book is not sanctioned by the Walt Disney company; author Jim Korkis had to cull his information from public sources. Unlike Maria Risma, however, he actually did the research and uncovered facts that are worth your time. He also managed to write in an interesting style that won't insult the reader's intelligence. Not Shakespeare or Dickens, but certainly readable and even entertaining. You'll come away having learned a lot about Song of the South, and you'll have a pleasant time getting there. As for the Off the Record Guide, to write it Ms. Risma's way, we strongly suggest that you pass it by completely, along with all other volumes of its ilk. It really is a pity, though; a little more care and a pinch of talent might've made this into something at least bearable. Instead, we find the lamest idea of the 21st century masquerading as a bona fide book.